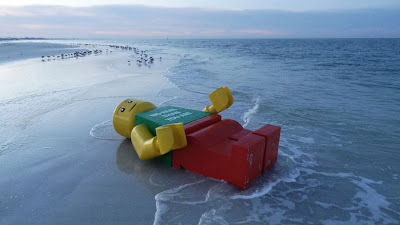 Boing Boing reader Jeff Hindman says he chanced across a "giant Legoman washed ashore" today while strolling on the beach at Siesta Key Village, Fla.
"It is very big, about 8 ft. tall," Hindman said. " ... I worked with Lego in my younger days, but this piece is amazing, it's still there on the beach." A photo of the creature shows it beached on a sandbank, in otherwise good condition. On its chest is the message, "No real than you are." This suggests it has the same origin as Lego men who washed ashore in Zandvoort, Holland, three years ago, and then in Brighton, England.